When most of Bhutan’s ethnic-Nepali minority fled their country in the early 1990s, most assumed they would eventually return. But nearly two decades on, this refugee population, which once numbered more than 110,000, has all but abandoned hope of repatriation. That was not the case in 2007, when the resettlement process was first brokered, said David Derthick, head of the International Organization for Migration (IOM) in Damak, a town in eastern Nepal which acts as the operational centre for seven surrounding refugee camps. Some in the camps discouraged others from signing up for resettlement, for fear that it would reduce pressure on Bhutan, the UN and international community to reach an agreement on repatriation. Others were holding out for different reasons, still determined to return to their homeland to reclaim their property and live in a familiar environment. But earlier this month, the 40,000th refugee was resettled, crystallizing a reality that has a snow-ball effect - it is all but certain none will be repatriated. Of those resettled, 85 percent are living in the USA. The rest are in Canada, Australia, New Zealand, the Netherlands, Norway, Denmark and the UK. They have been influential advocates of resettlement, said Derthick. “[The] people that they trust - the friends and family they have lived with for a couple of decades in the camps - have written [to] them and said, ‘Come’.” The population of one of the camps - Timai - has declined from 10,400 in 2007 to around 7,000 because of resettlement. 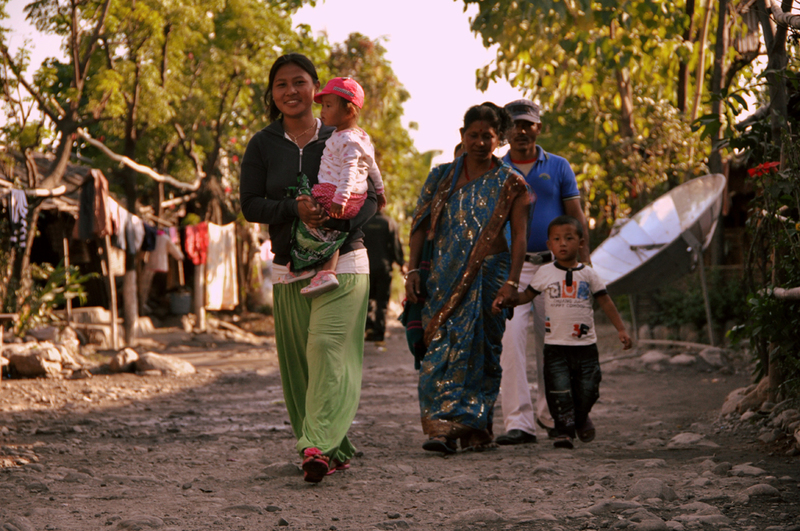 “I’m not sure where I want to go but anywhere is better than staying here,” said Phul Maya Tamang, a 30-year-old mother who added that resettled friends and family she talks to by phone tell her they are earning reasonable wages and living a better, if still difficult, life. Remittances, via Western Union branches just outside the camps, underscore the economic opportunities available to those who have resettled. For refugees remaining in Timai, options for earning money are few and unrewarding, and unofficial labour in nearby factories and fields is poorly paid since the refugees have no bargaining power. Of the roughly 73,000 remaining in the camps, only 18,000 have yet to apply for resettlement, says the UN’s refugee office (UNHCR), which, along with the IOM, is the main group in charge of the resettlement process. But that number is fast-dwindling, as the UNHCR receives 1,000 new resettlement applications every month. The conflict in Bhutan started in 1989 when - perhaps in response to the country’s growing ethnic-Nepali minority - then-Bhutanese King Wangchuck declared his “One Bhutan, One People” policy, giving primacy to the indigenous Ngalong culture, language and religion. What followed, say those in the camps, was a systemic and violent campaign not only to enforce the majority culture, but also to rid southern Bhutan of ethnic-Nepalis, who by then were a fifth of the country’s population. By 1992, more than 110,000 had fled to eastern Nepal, where they lived in limbo, until a 2007 agreement between the government of Nepal, UN and foreign governments paved the way for resettlement to start in 2008. The Bhutanese government has dismissed allegations that it used violence, and says most of those who left were recently arrived, illegal immigrants. However, most adults in Timai can readily produce Bhutanese citizenship cards. “Almost all here went back several generations in Bhutan,” said Gurung, holding up his citizenship card. International agencies operating in the camps say roughly 90 percent of the refugees can prove Bhutanese citizenship.